Which explains why the Maharashtra government has decided to bring in a biometric ID system specially for slum dwellers, to protect them from the greedy bunch. Reportedly, the identification system is meant for only those slum dwellers in Mumbai, who come under the purview of the state-sponsored slum re-development project. The government has taken the decision subsequent to receiving several complaints that alleged slum dwellers being enticed into giving up their property to real estate developers, looking to start illegal construction on these plots of land. “Initially, the identification process will be introduced in schemes approved by the state Slum Re-development Authority (SRA). This will help us reduce the number of complaints to a great extent,” Kshatriya said. Under the biometric ID system, a unique number will be created for each beneficiary. And the Brihanmumbai Municipal Corporation (BMC) has reportedly already started digitizing city maps to ascertain the authenticity of slum dwellers’ claims for accomodation under the SRA scheme. In future, the biometric system will be introduced for the Dharavi Redevelopment Scheme, and redevelopment of BDD ‘chawls’ spread across South Central Mumbai. Heightened concerns over security along with liberalization and strong economic growth have driven the Asia Pacific region toward high-end electronic access control systems in recent years. The sheer size of the market combined with low penetration levels make for huge market potential, and the advent of IP-based surveillance systems, the development of property sector in Asia acific, and fewer biometrics regulatory issues in Asia Pacific as compared to other markets such as the United States and the United Kingdom are all expected to contribute to the future growth of electronic access control systems (EACS) in the region, said a new analysis from Frost and Sullivan. The analysis on Electronic Access Control Systems Market in Selected APAC Countries, revealed that revenues in this market totaled $0.50 billion in 2006, and are likely to reach $1.34 billion in 2013. BANGALORE Nov. 5. Over 700 employees working in the Bangalore Mahanagara Palike (BMP) head office will soon have a new attendance recording system called Biometrics. The system, part of the BMP’s information technology initiatives, is likely to be launched on November-end. Ten of these machines, developed by Radiant Info Systems, have been installed at the head office for trial runs. The employees have been practising the use of these machines in the past week. 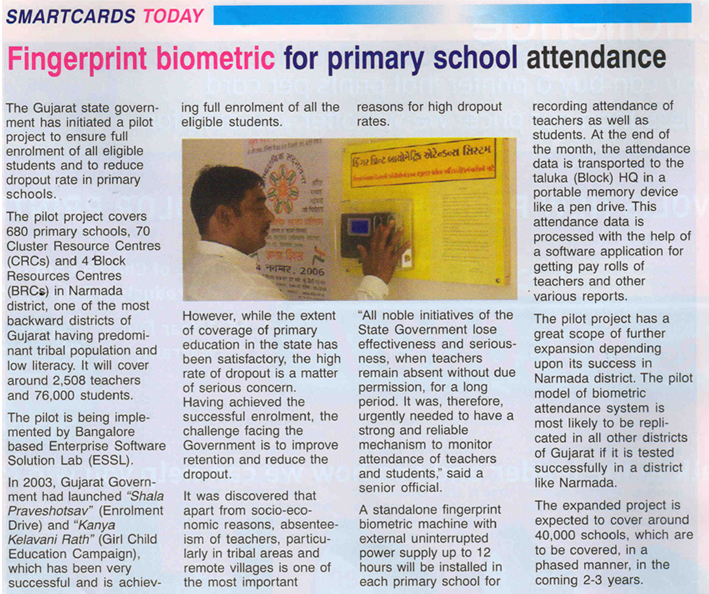 The BMP, in its budget for the year 2002-2003, promised to introduce Biometrics, a technology more advanced than the magnetic swipe card system installed at the Vidhana Soudha and other government offices in the State. In the first phase, the technology is being introduced in the head-office only. Based on its success, it would be introduced for all the 14,000 BMP employees at all levels, including the three zonal and field offices in the city, sources said. Under the technology, an employee has to press his or her thumb on the small machine fixed on a wall to record their attendance. The impression of the thumb matches with the one already stored in a computer, and this enters his or her attendance. The sources said though the system was also designed to record entry and exit timings of the employees and also for access control (to allow only BMP employees inside the office), the BMP planned to use it just to record the attendance for the time being. The technology was foolproof than a swipe card system wherein employees have to swipe a card issued to them on the machine. Under the latter, there were chances of malpractice as an employee can swipe the card for his colleague. The attendance recording system was basically to monitor the BMP’s workforce. Introduction of the technology would not only save paper work but also enable streamlining of administration, the sources added.